Natural England announces new approach to green farming schemes, which targets money at our most treasured landscapes and important habitats. Stewardship will help to protect and enhance the many important wildlife sites along the course of Hadrian's Wall. More than 100 of England’s most treasured landscapes containing our threatened wildlife and valuable heritage - including Darwin’s back garden, the setting for Brideshead Revisited and Britain’s oldest road - will be the focus of targeted conservation effort delivered through green farming schemes, under a new approach to environmental farm payments announced by Natural England today (Wednesday 26 November). From today, farmers and land managers in 110 different areas across England will be encouraged to co-ordinate conservation work across large areas, by undertaking similar environmental activities on their land through Higher Level Stewardship (HLS) schemes. Sir Martin Doughty, Chair of Natural England said: “The rise in numbers of cirl bunting in Devon and the improvements to hedgerows are just a few of the improvements we’ve seen thanks to farmers taking part in green farming schemes. As part of the initiative launched today, landowners will be able to select from the same set of HLS options as before, but more effort will be put into targeting those options that can deliver greatest gain for local landscapes and environments. Current options include a wide range of management activities such as creating larger habitats for birds and the provision of new public access, to a selection of capital work improvements such as maintaining dry-stone walls or restoring wetland habitats or traditional orchards. The 110 target areas across England cover over 4.8 million hectares, an area one third of England’s total land area; equivalent to 30 times the size of Greater London. Although Natural England is looking to focus significant resource on the target areas there remain a number of high priority features outside these areas where Environmental Stewardship (ES) agreements have a role. These more scattered features are addressed by regional plans that outline the priorities for ES outside target areas. In addition, Natural England’s Entry Level Stewardship (ELS) scheme supports a basic level of good environmental practice across the majority of England’s farming land. A network of Natural England advisers will continue to support farming businesses across England. £2.9 billion has been earmarked for Environmental Stewardship schemes between 2007-2013. There are currently 60,000 farmers in England who are signed up to these schemes, covering 63% of the agricultural land in England. The target area covers 75,600ha of heathland, wetland and arable and stretches from Castle Acre, Norfolk to Bury St Edmunds, Suffolk. Remnants of glacial history can be found today in the pingos (small, naturally occurring ponds created as the ice from the last glaciation melted) which contain aquatic invertebrates not found anywhere else. The area has more than 15% of the UK breeding population of the rare stone curlew, and a number of nationally rare plants such as Spanish catchfly and the perennial knawel. Other biodiversity includes lapwing, snipe, grey partridge, tree sparrow and turtle dove. Invertebrates include rare mining wasps that require loose sand, moths such as dwarf pug and maiden’s blush, and ground beetles such as the downy-backed set-aside beetle which has its UK stronghold in Breckland. Environmental Stewardship offers opportunities to protect these habitats and at the same time provide ecological benefits such as sites for ground-nesting birds. The target area covers 3,000ha site of Darwin at Downe, one of the three areas in and around London. The site is where Charles Darwin developed his theory of evolution by daily observations and experiments in his garden and the surrounding meadows, woods and hedgerows and wrote The Origin of Species. Darwin at Downe is the UK’s 2009 nomination for World Heritage Status, which will be submitted to UNESCO by the Government early next year. Darwin200 is a national celebration taking place next year to celebrate Charles Darwin’s scientific ideas www.darwin200.org Over seven species of orchid can be found on Downe Bank known to Darwin as ’Orchis Bank’, including the nationally scarce man orchid, while the heathland supports dwarf gorse and bell heather, both rare in London. Dormice have made a home in the broadleaf woodland and many species of birds and butterfly, including the white-letter hairstreak can be found. Environmental Stewardship will support the maintenance and restoration of ‘Darwin’s landscape laboratory’, including the nationally important sites for wildlife. The schemes will also help to fund educational access, improving peoples knowledge of the area. The target area is 173,500 ha and encompasses the nationally important landscape of the Peak District National Park and contains an unusually high coverage of nationally and internationally designated nature conservation sites. Notably the grasslands, scrub and woodland of the White Peak dales and the moors, and woods of the Dark and South West Peaks with their outstanding upland bird populations such as the ring ouzel, lapwing and twite. Species rich and wet grasslands, river corridors, parklands and other important habitats occur throughout the area. The Peak District also incorporates the Peak District Dales Catchment Sensitive Farming area targeted to reduce erosion and nutrient/pesticide runoff. The Lower Derwent valley has a high coverage of ancient woodlands and semi-natural grasslands, and is nationally important for woodland birds. 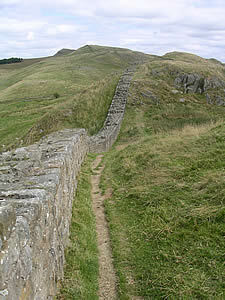 The target area aligns with the Hadrian's Wall World Heritage Site and includes numerous Roman era forts and other historic structures. Stewardship will help to protect and enhance the many important wildlife sites along the course of Hadrian's Wall. Among the habitats characteristic of the area are loughs and mires, and scarce plants, including wild chives which flourish on the volcanic Whin Sill rock. There are a number of nationally and internationally designated sites throughout the region including parts of the Northumberland Coast, which is important for wetland and farmland birds including tree sparrow, grey partridge, twite, lapwing and corn bunting. Currently agri-environment agreements cover more than 51,700ha of North East England. The Forest of Bowland Target Area is 36,700ha and forms a distinct upland block on the boundary between north Lancashire and the Yorkshire Dales and is designated as an Area of Outstanding Natural Beauty (AONB). The area is particularly valuable for blanket bog, upland heathland, upland springs and flushes, purple moor grass rush pasture, upland hay meadows and locally important limestone grasslands. Vulnerable species including the hen harrier, large heath and small pearl-bordered fritillary butterfly. Upland breeding waders such as lapwing, snipe and redshank are present. Vaccaries (associated with medieval cattle systems) are a distinctive landscape feature of the area. Home to Britain’s oldest road the Ridgeway National Trail used by prehistoric man, the Chilterns is also rich in archaeological remains including Bronze Age arrows, Iron Age hillforts, ancient green lanes, churches and parks. Rare butterflies such as the Duke of Burgundy with its distinctive black and yellow colouring can be found here as well as rare chalk loving plant such as cowslips and juniper and a range of farmland birds such as grey partridge and corn bunting. Environmental Stewardship will support management to provide nesting habitat and food for birds including turtle dove; and enhance the network of circular walks around the Ridgeway. The Somerset Levels Target Area contains nationally important areas for biodiversity including grazing marsh and wet grasslands which support key wildlife including breeding birds and wintering waterfowl such as redshank, golden plover and lapwing. Bats also rely on the presence of permanent grassland and woodlands. The area is also rich in historic features including a Registered Battlefield at Sedgemoor and traditional buildings. Target options within Environmental Stewardship include those that protect these historic environment features and options that maintain or create habitats for these important wildlife species. Incorporating Cannock Chase Country Park, this area includes internationally important heathland which supports populations of nightjar and woodlark and the Cannock Chase berry, the bilberry and cowberry. Bracken and scrub will be managed to prevent damage to archaeological sites and the surviving Great War features. A range of our scarcer species animals will also benefit including rare butterflies like the small pearl-bordered fritillary and rare moths like the Welsh clearwing. The headwaters of the River Hull are nationally important as the most northerly chalk stream system in Britain. This area also contains one of the four best-preserved wetland landscapes in England. The river valley supports a range of nationally important habitats and species including lapwing and yellow wagtail. Other Target Areas in the region to note include the Howardian Hills Target Area – which includes parkland at Castle Howard, where the film Brideshead Revisited was set. The area is important for declining arable birds and waders, notably the tree sparrow and curlew. The smallest Target Area (1500 ha), Stanwick St John also lies in this region, north of Richmond and has been targeted due to the Stanwick late Iron Age oppidum and the nationally important arable bird assemblages that can be found here.